Richard Sears was working as a railroad station agent in North Redwood, Minnesota, when a local jeweler refused a shipment of watches. The shipper offered them on consignment to Sears. The deal proved profitable, and Sears ordered more watches to sell. Within the year, Sears had quit the railroad and set up a full-time mail order business in Minneapolis, in 1886 calling it the R.W. Sears Watch Company. A year later, Sears moved the business to Chicago, where he formed a partnership with Alvah Roebuck. In 1893, the company name officially became Sears, Roebuck and Co.
We Handle Raw Furs - We do not buy these furs ourselves, but immediately upon receipt of them we notify a number of fur dealers who bid against each other, and we dispose of them to the highest bidder. The amount received is immediately sent to you, less the express charges which we paid upon receipt of the goods. If you prepaid the express charges, the full amount received is sent to you. We deduct no commission, as this department is solely for your accommodation. The first Sears, Roebuck and Co. Raw Fur Marketing Service depot opened for business in 1925, the same year the first Sears department store also opened in Chicago. The response from trappers was overwhelming, and a second receiving depot was soon opened in Philadelphia. To take care of trappers in the West and Northwest, a Dallas depot was added in 1927 and one in Seattle in 1928. In 1929, Memphis and Kansas City depots were added. A station opened in 1949 in Des Moines. Denver and Minneapolis depots were also added. Beginning with the 1926-27 season, Sears began mailing a booklet to those who had shipped them fur. It contained trapping tips and proper fur-handling instructions. The first was titled Secrets of the Trapping Trade by Johnny Muskrat. The second (1927-28) was titled Trapping and Fur Farming by Johnny Muskrat. This one was devoted mainly to the fictional Johnny Muskrat taking trips to area fur farms. 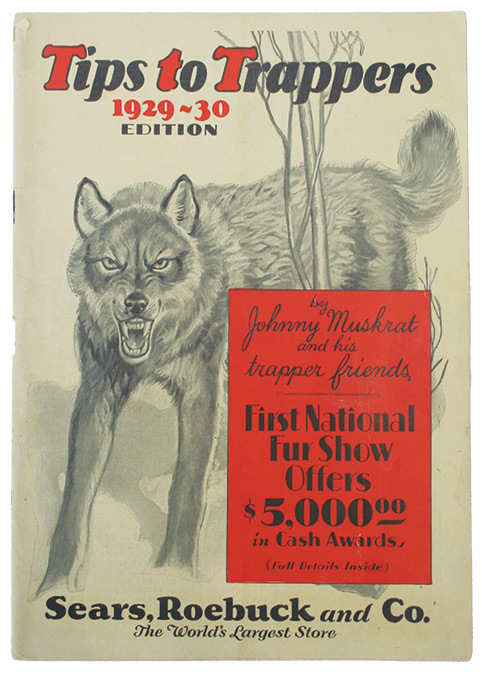 The third booklet through the last in 1958 were all titled Tips to Trappers by Johnny Muskrat. This first Tips to Trappers was the only one printed in full color throughout and included a full page about each furbearer animal. 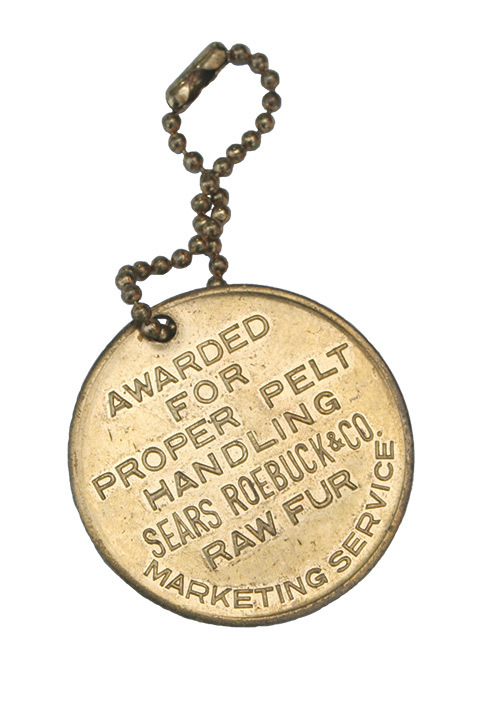 In the fourth Tips to Trappers (1929-30), Sears announced the First National Fur Show, a program which offered $5,000 in cash awards for well-handled fur. Winning trappers also received a certificate and a brass key chain medallion. The awards program continued for 26 years, through the 1955-56 edition of Tips to Trappers. According to company records, by 1946, Sears Raw Fur Marketing Service had handled 4 million shipments and paid out Sears drafts to the tune of $45,000,000. Sears Tips To Trappers content from 1931 through 1958 was much the same: testimonials from trappers, prize-winning photos, trapping tips, and a fur market outlook. Each Tips To Trappers included four shipping tags complete with the return address to one of the nine Sears receiving depots. Beginning with the 1931-32 Tips To Trappers and continuing through 1935-36, a Johnny Muskrat folding pocket knife was also offered in each issue. However, the advertisement shows stag handles and not the cream-colored plastic handles with embossed Johnny Muskrat and muskrat figure on the handle that today’s knife collectors crave. Another interesting note is that throughout the entire run of Tips to Trappers, raccoon pelts were put up open and stretched square. Researching this a bit further, I found the following notice in the 1970-71 F.C. Taylor catalog: Raccoon from all states except Texas, Louisiana, Georgia and Florida should be stretched “cased,” and that raccoon from the above four states should be stretched square. Prior to this, apparently, all raccoon hides were stretched square. The last Tips to Trappers was mailed before the 1958 season. Sears 1959 fall catalog announced the end of the fur marketing service, effective June 30, 1959. Collectors may pay $75 each for one of the first four Sears booklets as well as the last Tips to Trappers, all in good condition. The rest may bring up to $20 each. An award medallion in good shape may command up to $300. Galloway, OH 43119; (614) 878-6011.